How do you cope with being alone? I found this while searching through my favourite sites, the colours jumped out at me and slapped me in the face. I am often on my own, riding the world solo, and this triggered me to write and reflect on my solo-ness. Yes that is a word, because I just made it up. Being on your own is not for the faint hearted. Or so my Mum used to say. I am an only child and hence a product of many solo hours and alone time. I have spent much of my adult years alone and now I find myself even more alone. My immediate family have all died in the last 4 years, stumping me, abandoning me, bewildering me, the raw reality is that, I am actually now all alone. It is a strange thing to say I am alone though, because really we are never alone. There are always people around, the world is full of possible daily interactions, but the connections, or understandability, or “get it factor” can be minimal or low. I do not like shallow conversations, I am more inclined to talk about meaningful things, reflect on history, talk about world issues, or converse on something interesting. I mostly travel solo. It is so strange to me to see people travelling in groups and pairs; ‘how do they find all those people to travel with?’ I wonder to myself. The problem is, most people can not afford to travel as freely as I do, they can not afford the time, money or freedom. Partners, children, full time jobs, mortgages tend to hold people back in life, I do not have any of those things to worry about or to hold me back. I travel extensively for inspiration, to learn about others, and to learn more about myself. The more I push out of my comfort zone in life, the more I learn about myself and about life itself. This can often only be achieved through solo endeavours. Travelling propels me forward towards enlightenment. I am inspired by the constant movement, daily variety, non existent routines, and the amazing array of interesting people and experiences that can cross your path is mind blowing. Travelling solo inspires me to write, photograph and reflect. 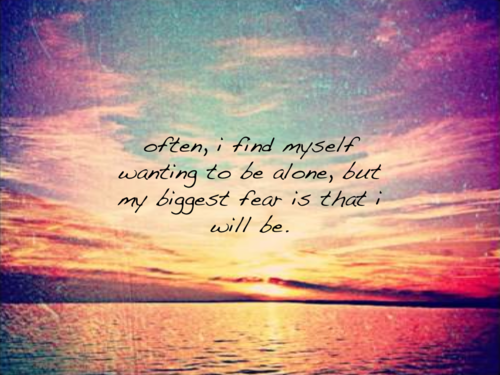 I am afraid that I will remain alone though. I do hope to find a companion to share my journey with and to share my life with. Perhaps my solo upbringing has caused some dysfunction where I can not maintain relationships? I do not know. All I do know is I cannot maintain relationships! Lol. For better or worse they do not seem to work out. I put it down to the fact I have not met the right person yet. I have friends who are never alone. If they have been alone it has been for a very brief moment in time and they hated it. Absolutely despised it. But sadly it does not feel like a choice. Sure I have friends, but really you do have to be okay with spending time on your own. How do you cope with being alone? Do you crave your own time, what would you do if you could do anything on your own? Reach out to me, because as you know, I am riding this adventure solo. I spend a lot of time alone and mostly I enjoy it but sometimes I wish I had a companion to share the journey. I have high functioning autism so I find maintaining relationships quite difficult – not because I don’t love and care for people but because my tendency to say the wrong thing or do something I shouldn’t, (or not do something I should) is quite high. I frequently find myself in this place of tension where I want to maintain a place for being solitary in my life but I’d also like very much to have someone special too. I’m sure it will work itself out in the end. I don’t think I ever traveled along (other than day trips) and at the moment I would love to go off somewhere on my own for few days or a week. I love alone time, because it gives me time to think, observe and paint. ← South Hampton Part 2: Touring, Movies and Indian food.